“(July 11, 2015) Today’s event of losing such a great mind and an even greater person have brought memories of my childhood to the foreground. While remembering so many great times, the man behind many of those would surface. I remember receiving my first Gameboy so clearly. I was finally able to play a game that I had waited for what seemed like ages. I spent all my birthday money on Pokémon Blue. My excitement could not be contained and before we even left the store, I had ripped the box open. During the car ride home, I didn’t take my eyes of my screen, didn’t make any sounds, just this huge grin stretched across my face as I was about to encounter the biggest decision of my life: which Pokémon would I choose. I played that game in secret under my blanket for hours past my bed time that night and many nights to come. When I returned to school, that’s all my friends and I would discuss: what stages we were at, tips on getting through the dreaded rock tunnel and how to get past that annoying Snorlax! It consumed us but in such a fun and memorable way. Even as shy as I was back then, it was the bridge that built my courage to speak to new people like asking what Pokémon they had and if they wanted to trade, etc. It was something that my parents thought was impossible. How shocked and speechless they were as they witnessed their insanely shy son approaching new people with a newfound confidence. This game took up a huge part of my childhood and every time I think back, the corners of my mouth curl up in to a smile. “It was not a secret that Nintendo’s CEO and President, Satoru Iwata, had been ill lately. Missing shareholder meetings, the Electronic Entertainment Expo and noticeably losing weight, last year he underwent surgery to remove a bile duct growth. The surgery was a success and Mr. Iwata commented that the growth “was detected very early and [he] had no symptoms.” He seemed to be in good health. Mr. Iwata was present at a shareholders meeting only a few weeks ago. His passing on July 11th, 2015 from a bile duct growth was all the more shocking. At the age of 55, Mr. Iwata was not a young man nor was he an old man. He leaves behind a legacy and career that includes being a programmer, director, producer and president. “On my business card, I am a corporate president. In my mind, I am a game developer. But in my heart, I am a gamer” was how he described himself. 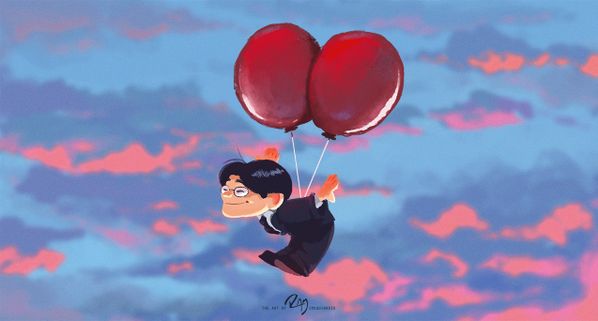 In the 1990s, Mr. Iwata worked at HAL Laboratory on some great games including the Kirby games, ‘Balloon Fight’ and the beloved RPG ‘Earthbound’. Upon ascending to President of Nintendo, he led his company through the release of two major games: the Nintendo DS, which sold over 154 million units and still is the best selling video game handheld ever made, and the Nintendo Wii, which sold over 100 million units and appealed to people who never even played a video game. The sales for the Nintendo 3DS started slow but have been able to make a resurgence. It’s quite impressive considering the rise of smartphone games. His legacy not only includes Kirby, ‘Balloon Fight’ and ’Earthbound’, but he also directed the original ‘Super Smash Bros’ for the Nintendo 64 and when its sequel ‘Super Smash Bros Melee’ looked like it would not release on time, Mr. Iwata did a code review and debugged for the game, even though by this time, he was the President of Nintendo. Out of all the games Mr. Iwata helped create, ‘Pokémon Gold and Silver’ had the most significance to me. In my mind, those are not only the best Pokémon games but are part of the greatest video game sequel. I still remember journeying through Johto, beating the gym leaders, collecting all the badges, beating the Champion and finally, the Indigo Plateau. I thought my adventure was done only for Kanto, the region from the first Pokémon games (Pokémon Red and Blue), to be unlocked. Now, there were eight more badges to collect, the return of many beloved characters and a final climatic battle with Red, the character you played as in Pokémon Red and Blue. It was Mr. Iwata who made this possible. He was the programmer responsible for compressing Gold and Silver so that Kanto would fit onto the GameBoy cartridge. The day after his death, I played the recently released Wii U title ‘Splatoon’ and one feature I loved about that game is the integration it has with Miiverse, Nintendo’s social media platform. As soon as I started up the game, everywhere I looked in the hub world, there were posts and more posts from fans mourning his death and paying tribute. It is amazing to me that anyone who owns a Wii U or a 3DS can post to Miiverse to pay tribute to Mr. Iwata. In recent years, Nintendo has been losing market share to its competitors. The Wii U has not been as successful as the Wii. Nintendo has been doing terribly financing and in March 2015, they announced their first operating profit in four years. Last year, Mr. Iwata took a pay cut of 50% because Nintendo’s poor financial results. For that, Mr. Iwata earned my respect as any other CEO would certainly not take such a huge pay cut. Satoru Iwata’s legacy lives on every time we press start on any of the great video games he had a hand in creating. I find it a fitting tribute that he leaves us with the upcoming ‘Super Mario Maker’. A video game that will push us to use our imagination to design our own levels. Just like Mr. Iwata did. 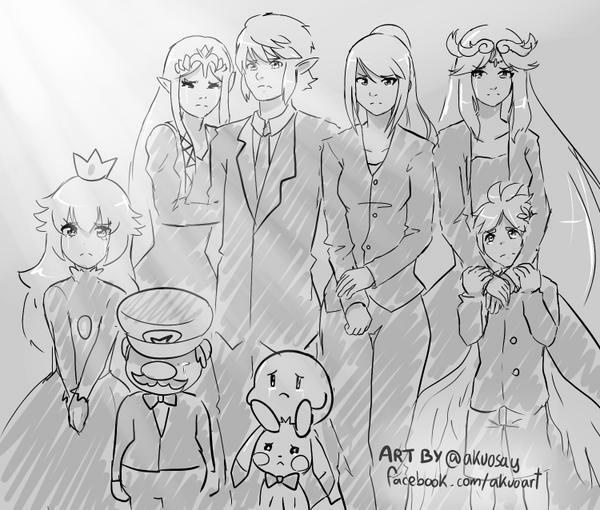 Nintendo Characters Paying their Respect by @AkuoSay. “1999 was a Christmas I particularly remember with fondness. I was twelve-years-old and amongst other thoughtful gifts, I had generously received a copy of two of the latest Nintendo 64 games of the time – Jet Force Gemini and Super Smash Bros. The latter cemented my love and admiration for Nintendo’s ability to produce unique and novel gameplay concepts, creating an IP that would be cherished by millions throughout the proceeding decades. 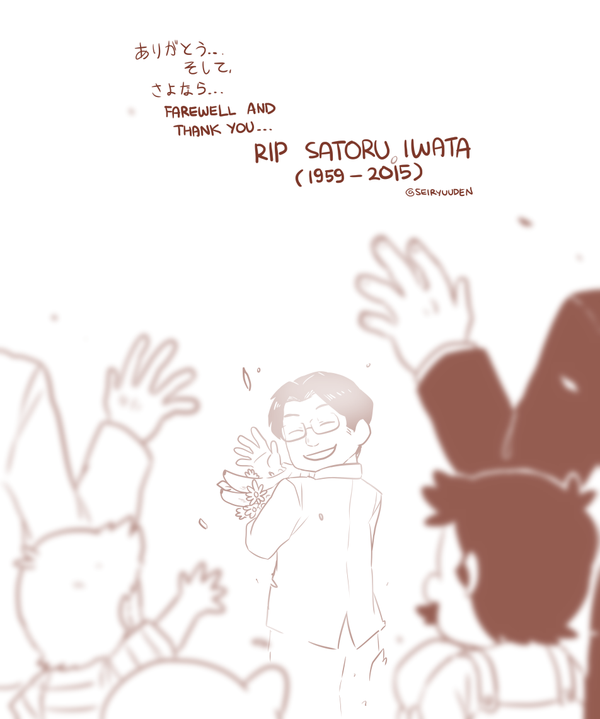 Farewell, Mr. Iwata by @seiryuuden. Thank you, everyone, for participating in this commemorative piece. And thank you, Mr. Iwata for your inspiration and kindness. You have honored us with your innovative mind and we hope that you are doing well wherever you are. This entry was posted in Articles and tagged CEO, creativity, farewell, games, iwata, japan, NES, nintendo, pokemon, programmer, satoru, video games, Zelda. Bookmark the permalink.